We are fortunate to have an exceptionally talented longarmer working on our Nolting longarm machine. 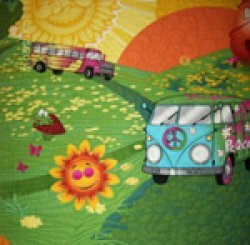 She can make your quilt look fantastic with texturing, edge to edge or custom quilting. Come in and let us help you choose a pattern and thread. Your satisfaction is important to us. You may also contact us by phone for specific information. Here you can see some of the quilting. done with it's own design. These are some of our all time favorites. They both hang in the shop for our customers to enjoy. 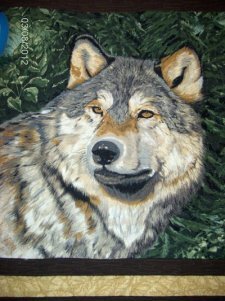 We tell everyone to feel the wolf because his fur feels almost real. 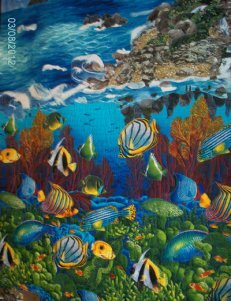 The underwater quilt was inspired by Rob Appell's book "Making Waves the Adventures".